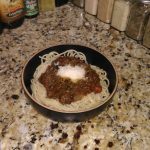 One of my favorite meals due to the savory tomato flavor, and the ease with which it can be portioned out into single-serve freezer packs. 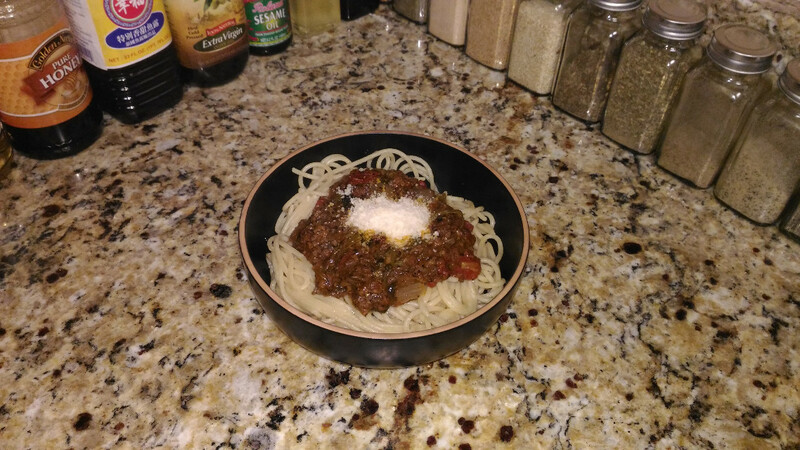 This recipe will make 7-8 6oz servings (for 3 or 4oz dry spaghetti), depending on the extra ingredients you add, and how much you boil it down. If using onions, take half and carmelize in a 1gal+ stock pot. Can use a pinch of baking soda to speed the process. Brown ground beef in the onions. Add tomato sauce, tomatoes, cream of mushroom, sugar, salt, flour, and Italian seasoning. Add half of the mushrooms. Simmer on low heat for at least an hour, or until thickened to satisfaction. Stir occasionally, scrape up the stuff that sticks to the bottom, mixing it into the sauce. If other vegetables are to be added, throw them in a bit before the sauce reaches the desired thickness. Serve. About 6-8oz does nicely for 4oz of dry pasta. Top with Parmesan cheese.